Turn to us for flooring that embodies the perfect balance between beauty and functionality. We offer a wide range of products and materials that hold up well in even the busiest of households. One of the increasingly popular and practical options from our showroom is luxury vinyl tile. In Ann Arbor, Michigan, we are your source for this beautiful and durable material. As the name suggests, luxury vinyl is nothing like the vinyl floors of years past. Designed to look and feel exactly like your favorite floor materials, we carry vinyl that is sure to impress in any environment. Commonly referred to as “resilient flooring,” luxury vinyl continues to look great far into the future. Luxury vinyl tile and plank flooring are popular choices for homeowners. Thanks to advances in design and manufacturing, this material is as beautiful as it is durable. Vinyl is composed of composite materials which are set in layers. As a result, plank and tile flooring both exhibit a non-porous surface that is highly resistant to water and staining. It is common to install luxury tile or planks in high-traffic areas or places prone to moisture. Of course, luxury vinyl creates a distinct look and feel for your interior as well. Whether your interior design goals include a rustic aesthetic or a modern direction, vinyl can meet your needs. Both plank and tile flooring are available in a wide selection of colors, patterns, and designs. In fact, this flooring material can also emulate the appearance and texture of natural materials like stone and hardwood. All in all, luxury vinyl is a sound investment for any remodeling project. There are plenty of reasons why luxury vinyl is widely regarded as “resilient flooring.” The manufacturing process allows both plank and tile floor to present a distinct underfoot feeling, which also makes it highly resistant to scratches, dents, and scrapes. Dining rooms are a great fit for luxury vinyl since it absorbs the impact of shuffling chairs and foot traffic. On top of that, the “every day” capabilities of luxury vinyl make this a fine addition to households with children and pets. When you need a waterproof floor, vinyl always makes for a smart choice. To keep your investment looking neat and tidy, simply use a recommended cleaning solution and a mop or rag. Dust and dirt are easier to identify against vinyl, so maintenance is a simple matter. Why Choose Luxury Plank Flooring? You don’t have to sacrifice style for durability. Choose luxury vinyl flooring for wet areas like the kitchen and bathroom if you are interested in a surface that can last longer than 15 years when maintained properly. The low-maintenance luxury vinyl designs available among our selection perfectly mimic the look of popular tile, making it great for a number of different spaces. Whether you are interested in a style that resembles rustic natural stone or classic granite, you are sure to find it at our showroom. Make your shopping experience a breeze by turning to the team you can trust. We are committed to the satisfaction of our clients, and this often means helping them find floors that satisfy in appearance, price, and performance. Our in-store associates remain familiar with the many types of luxury plank flooring available, allowing them to expedite the shopping process. The luxury planks we carry come with varying stains, finishes, grains, and textures. When you shop at our store, you are sure to find the perfect product that fulfills your unique tastes. It is no secret that luxury vinyl plank and tile are both sound options for the active household. Count on our showroom to find the right flooring to meet your needs. Our showroom features a wealth of flooring products from the well-known manufacturers and brands, including Congoleum and Beauflor. These established brands have gained in popularity with busy families because the finish on these products is designed specifically to counteract the damaging effects of water and stains. Congoleum and Beauflor are popular choices for homeowners who wish to invest in a waterproof floor. Available in plank and tile options, these flooring products will stand up to everyday wear and tear with ease. The distinct finish of these products is sure to accommodate your interior design goals. In conjunction with tough, stain-resistant finishes, flooring from Congoleum and Beauflor will serve your property well for years. Once you have made a purchase, leave the installation to us. We employ a team of installers with decades of combined experience who are prepared to perform your luxury vinyl tile installation promptly. 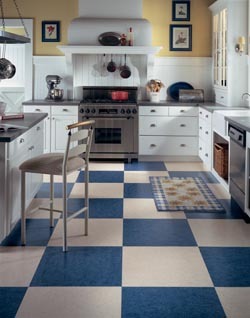 Flooring that is installed properly impresses guests and adds lasting value to your property. Count on our team to help you bring out the most from your investment. We work with highly qualified installers to measure your project area and install your new flooring for you. The result is always an interior which instills pride and satisfaction. Work with our associates today to get the flooring you have always wanted. Contact our showroom to learn more about our selection of luxury vinyl tile and plank flooring. We proudly serve property owners throughout Ann Arbor, Michigan, as well as Ypsilanti, Plymouth, Brighton, Jackson, and the surrounding areas.